To celebrate Ty's recent nomination for the UK's Mercury Music Prize and also his inclusion as one of only two Black British artists to make the US's Shortlist Prize longlist, Big Dada are releasing this limited edition single of one of the finest moments from his album, "Upwards". 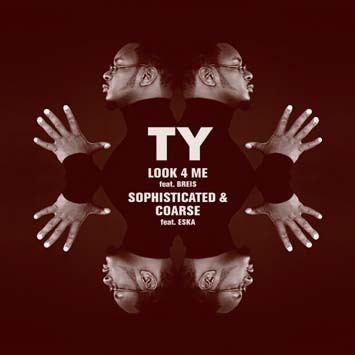 As well as Ty's usual consummate mixture of social commentary, humour and easy-going wisdom, "Look 4 Me" also features the unique vocal talents of Eska Mtungwazi, a singer and musician who has worked with everyone from Quite Sane, Nitin Sawney, Soweto Kinch, Tony Allen and New Sector Movements. And in case you're not getting just how good she is, and just how well she works with Ty and his production team, Lizzie's Children, we have also included the killer track, "Sophisticated & Coarse". Originally released as an exclusive for legendary British DJ Gilles Peterson's "Worldwide Exclusives" compilation, this is its first full release on vinyl. And it's a beauty!